I was going to wait until I had time to post this, but I just can’t – I’m too excited to show it to you all. I live 18km outside of the city of Udon (NE Thailand). About 3 weeks ago a friend was visiting our property. After supper, I took him to the far corner of our yard to view the fireflies, about 8PM. The area is heavily shaded (during the day) with native trees and is on what my wife calls a giant termite pile (emphasis on giant). It’s pretty much a swampy area, except for on the approximately 30m square termite pile. The area has mongoose, wild ducks, and white rump shamas as well. As we were entering that area, we noticed a yellow krait off to the side of the trail. When we looked closer (but not too close! ), it appeared to be one krait (the shiny one) eating another krait (the not so shiny one that’s on the other side of the netting). But as we observed a bit closer, we could see the tails of the two snakes intertwined, apparently mating. Our best guess was that the shinier of the two kraits was about 1.5 meters, while the duller of the two appears to be slightly shorter. The snakes made no attempt to strike. The male finally broke away from the female after we observed for about 10 minutes…….that’s when we left as well. Hope this provides some insight into the yellow kraits in the NE of Thailand. It definitely does provide some insight. 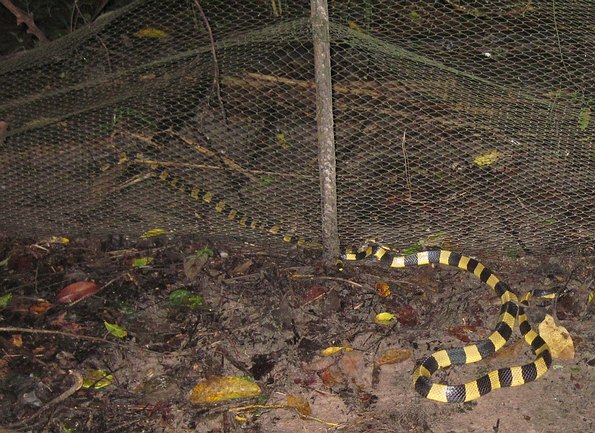 Establishing that banded kraits (Bungarus fasciatus) mate at night in Udonthani in October – on 10/9/11. It also shows that barriers to sexual union might not be barriers at all. Species can cross from one habitat to another despite barriers. Sure it’s not a river, but it’s something to see that snakes disregard the net between them and find a way to mate with the obstacle between them. If you look at the close up photo – they appear to be mating from opposite sides of the netting. Is that great, or what? Photos all courtesy of John and Copyright 2011 John Oles. There is very little on Wikipedia about the breeding behavior of these snakes, I’ll post what is there and have a look around for more information to post later. The mating season for this subspecies (Bungarus fasciatus) is in the months of March and April. About 2 months after mating, the female lays 4 to 14 eggs. The females remain with the clutch of eggs until the young animals have hatched. Contrary to pythons these snakes do not incubate the eggs but only guard them. The incubation period of the eggs amounts to between 60 and 64 days. The new born animals are between 32 and 34 centimetres long. So, these snakes mating in October shows that there are multiple times of year these snakes are capable of mating in Thailand. Perhaps it varies by location in Thailand?